How does a song come to life on screen? In New Haven filmmaker Gorman Bechard’s latest rock documentary Who Is Lydia Loveless?, the magic lies in the editing. Bechard’s movie follows Lydia Loveless, a 24-year-old country rocker from rural Ohio, as she and her band tour across the Midwest in 2014 and 2015. Bechard, who has made a name for himself in recent years as a consummate chronicler of the passion, restlessness and unpredictability of those devoted to rock ‘n’ roll, finds in Loveless a case study for the expressive potential and logistical difficulties of trying to make a living as a full-time musician. April 20, 2016 - When the widow of Cuban filmmaker Tomás Gutiérrez Alea reached out to Margherita Tortora, senior lecturer in Spanish at Yale, to ask if she would consider a celebration of her late husband’s work on the 20th anniversary of his death, Tortora jumped at the opportunity. She knew that she had limited resources to put on a film festival, but that hadn’t stopped her in the past. Alea’s widow, the director and actress Mirta Ibarra, was excited. This way, both students and members of the public could benefit from a re-evaluation of the work of one of the most influential directors in Cuban history. This Thursday through Saturday, those months of planning will come to fruition when a local series about contemporary Latin American cinema comes to a close with a five-film tribute to Alea, showcasing the Cuban director’s resonant, ambivalent patriotism. Four of his most celebrated films, as well as a documentary about the director, will play at Yale’s Luce Hall auditorium at 34 Hillhouse Avenue. All of the screenings are free and open to the public. March 24, 2016 - Born into a family that revolutionized American breakfast culture by popularizing the bagel, Jay Lender — whose feature film debut, They’re Watching, comes out in limited release on Friday — knew from an early age that he wanted to be an artist. February 22, 2016 - How do you stay focused when making a movie about a musical work based on a collection of poems written about the life of a World War II medic? For local five-time Emmy Award winning documentary filmmaker Karyl Evans, the answer is easy: Focus on the people. Even in a multilayered work like Letter from Italy, 1944: A New American Oratorio, a film about art, war, and PTSD that Evans released in 2015. January 22, 2016 - Just after the closing credits of Color Me Obsessed, Gorman Bechard’s 2011 documentary about the rise, fall, and lasting influence of the ‘80s punk rock band The Replacements, musicianPatrick Stickles struggled to articulate just what made their music so exceptional. December 21, 2015 - From Chapel West to Crown Street to the Hill to Wooster Square, New Haven’s construction boom is causing ripples in the city’s sense of place. For some, these moments of transition can be jarring; for others, they offer the perfect opportunity to reflect on the history and symbolism and social impact of New Haven’s physical landscape. November 13, 2015 - You’ve seen Travis Carbonella before. Jumping on and off stage at Jose Oyola’s show at the College Street Music Hall; trailing along with the giant puppet parade in Westville; interviewing people all over downtown about their lives, their backgrounds, their passions and talents. Carbonella is a freelance videographer, and a dedicated storyteller. He’s New Haven’s Man with a Movie Camera, capturing the essence of this city one video at a time. November 12, 2015 - In The Passionate Pursuits of Angela Bowen, which will be playing this Thursday night as one of the opening movies in the 2015 New Haven International Film Festival, director Jennifer Abod documents the many challenges and triumphs of a woman who continually sought to reinvent herself as she came to know and embrace each aspect of a complicated identity. Indeed, the film is a sort of love letter — a well-deserved and carefully made one — to the New Haven dancer, feminist, civil rights activist and scholar offers a loving portrait of a life defined by difficult transitions, hard-won success and lasting personal and professional influence. Abod, a feminist media producer who has also been Bowen’s partner for the past 35 years, called into the latest episode of WNHH radio’s “Deep Focus” to talk about the life and legacy of someone who never yielded to the persistent forces of racism, sexism, and LGBTQ discrimination. November 2, 2015 - New Haven-based filmmaker Brendan Toller excels at making music documentaries that are about more than just the music. His first two feature films, I Need that Record! (2010) and Danny Says (2015), document the communities of artists, fans, record store owners, and journalists who live to discover new music and share the music they love. Without their voices, Toller’s movies contest, the story of music, and of punk rock in particular, is conspicuously incomplete. 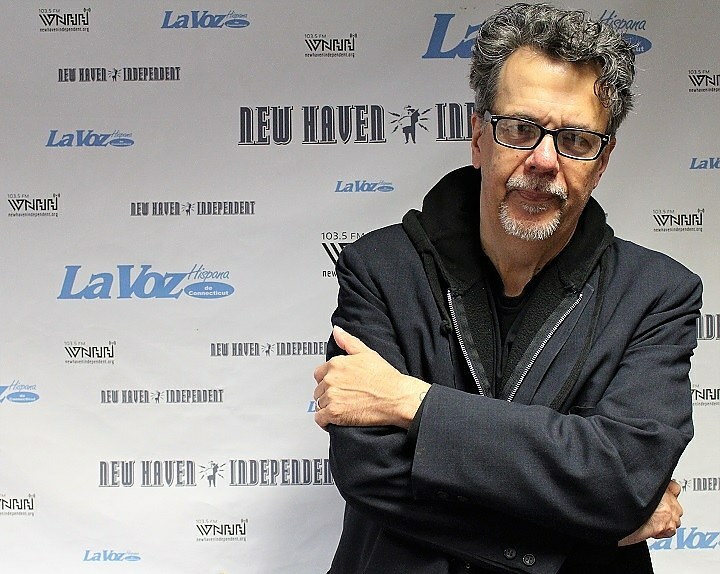 Toller (pictured) came by WNHH’s “Deep Focus” to discuss making movies about music, the importance of preserving those spaces where we learn about new and interesting art, and the benefits and challenges of being a filmmaker in New Haven. Click on the audio player below or subscribe to the WNHH podcast on iTunes to listen to the full episode. Watching other people’s home movies may at first glance seem like a strange candidate for the coolest way to spend an afternoon. But for Wheeler, an archivist at the Beinecke Rare Books and Manuscripts Library who specializes in audiovisual material, Home Movie Day represented a perfect intersection of three pursuits she cares deeply about: film preservation, social history, and community engagement. September 28, 2015 - Gone are the days when every movie theater in the country was equipped to project film. With the rise of digital cinema, movies are now cheaper and easier to produce, distribute, and exhibit than ever before. But what about those theaters that can’t afford to purchase digital projectors? What about those filmmakers who cherish the physical dimension of film and its inimitable impact on the visual quality of a movie? And what about the potential loss of the medium so central to the history of cinema: the very material on which movies were produced and projected for the first century of the form’s existence? September 21, 2015 - Women are underrepresented in film. No matter the success of Hunger Games or Bridesmaids or Spy or Trainwreck, women filmmakers and female stories are consistently given short shrift in an industry that is notoriously conservative, reluctant to stray too far from the formulaic, male-dominated productions that studios know will achieve a satisfactory return. If women in general encounter a fair amount of resistance from a recalcitrant and prejudiced industry, lesbian women suffer from even greater cinematic neglect, both in front of and behind the camera. Lesbian women are doubly marginalized in the history and practice of film, often overlooked by mainstream production companies for daring to represent gender and sexual identities other than that sanctioned by prevailing social norms. September 15, 2015 - Donald Margulies knew right away that Although Of Course You End Up Becoming Yourself , a book about five days’ worth of conversations between Rolling Stone journalist David Lipsky and novelist David Foster Wallace, contained a story that he wanted to tell. A Pulitzer Prize winning playwright and Theater Studies professor with years of experience writing movie screenplays for hire, Margulies saw in this book two characters with unique voices, powerful anxieties, and a complex relationship predicated on admiration and mistrust. September 10, 2015 - Gene Tierney’s character in the 1945 melodrama Leave Her to Heaven is not exactly the best role model for young women. She is so jealous of her husband’s attention that she drowns her disabled brother, throws herself down the stairs when she’s pregnant, and even (spoiler alert) kills herself and frames her sister for the murder. But for Kirsty Dootson, a doctoral candidate in Film, Media and Art at Yale University, Tierney and Leave Her to Heaven represent exactly what a lot of women like to see on screen. June 12, 2015 - John Sayles, one of the forefathers of American independent cinema, made a movie about another Northeastern city in the early 1990s, a city that looked a lot like New Haven. It still does—and he’s coming to town to watch it again along with a bunch of his other masterworks.